the 2015 brady campaign state scorecard – how does it score? Many years ago, the Brady Campaign to Prevent Gun Violence Ownership would release a yearly “Scorecard” to judge, based on their subjective and ever-changing standards, how well the fifty states were doing at implementing their desired “gun control” regulations. Of course, we pro-rights activists would routinely dismantle, discredit, disprove, and generally destroy this “Scorecard” as being in any way useful, and they fell out of the habit of making such a fanfare of it. In fact, the last one I can find published anywhere on the internet was from 2015, and was buried – almost like they were ashamed of it – in this rather paltry attempt at a knockoff of a TripAdvisor report of some sort. From this 2015 “Scorecard”, we can determine a few things. No state, not even California, gets a perfect score. Even with all of the draconian laws that California has in place regarding firearms, the Brady Campaign does not think it is enough yet. This is, unfortunately, a typical mindset for the “gun control” extremists – they get a piece of the cake, and keep wanting more and more and more. The Brady Campaign has no idea what they are talking about. For example, they penalize states 12 points for allowing non-residents to apply for carry permits by mail. For some reason, though, they neglected to deducted 12 points from Connecticut’s, Idaho’s, and New Hampshire’s tallies for doing exactly that. If we cannot trust them to get the basic facts right, how can we trust them on anything else? Speaking of “basics”, the “Scorecard” informs us, in big, bold font at the very top that “States can receive a maximum of 100 points”. From checking the various positive point tallies, this is true. However, it also leads the reader to believe that the states are judged on a 100-point scale. This is false. It appears possible for states to achieve scores of -47, and, in fact, Arizona has the distinction of the lowest score at -39. How does a 147-point scale make any sense? Finally, the Brady Campaign had to blatantly massage their numbers to come out as “good” as they did, and they still are not that good. But we will get to that. All that said, the Brady Campaign incessantly claims that all of the various “gun control” laws they desire will somehow make people safer. As such, it seems logical to conclude that – if they are correct – violent crime rates will be lower in states that have higher Brady Scores. 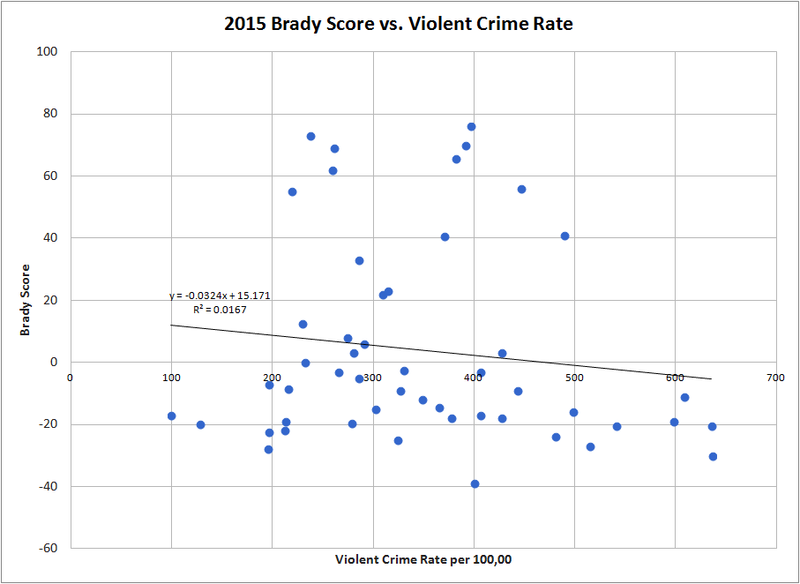 It does look like, impressively enough, that the Brady Scores and the violent crime rates of the various states correlate with a coefficient of -0.129, indicating a very weak – but negative – correlation. This means that as the “Score” increases, the violent crime rate tends to decrease slightly. There is a section of the Brady Scorecard entitled, “CATEGORY 3: MAKING OUR NATIONAL GUN VIOLENCE PROBLEM WORSE”. In this category, states are rewarded, or penalized, for their “gun death rate”. Notably, this number is cited as coming from “A Violence Policy Center analysis of Centers for Disease Control and Prevention data” from 2013; why did they not just use they CDC data directly, and why not the data from 2014 at that? Regardless, I am attempting to correlate a state’s violent crime rate with a “Score” that already includes an aspect of violent crime – naturally, this will strengthen the correlation. As such, I went through and removed those points – positive or negative – from all states’ “Scores”. Additionally, states are rewarded or penalized in this category for the number of “crime guns” per 100,000 residents exported from their borders – that is to say, firearms that were used in crimes in other states, but were originally bought in the state they are being scored against. Notably, not even Hawaii – an island with significantly restrictive “gun control” laws – received a perfect score for this section. Also, it is intriguing that the Brady Campaign is willing to give any “crime guns exported per 100,000 residents” a positive score – apparently they are willing to tolerate up to 13.2 per 100,000. But, regardless, if firearms are exported out of a state and used in a crime in another state, they have no bearing on the safety of the people in the state that they are being scored for or against. As such, I went through and removed those points from all states’ “Scores”. Now that the “Scores” have been corrected from the Brady Campaign’s blatant attempt at massaging the data, what is the outcome? 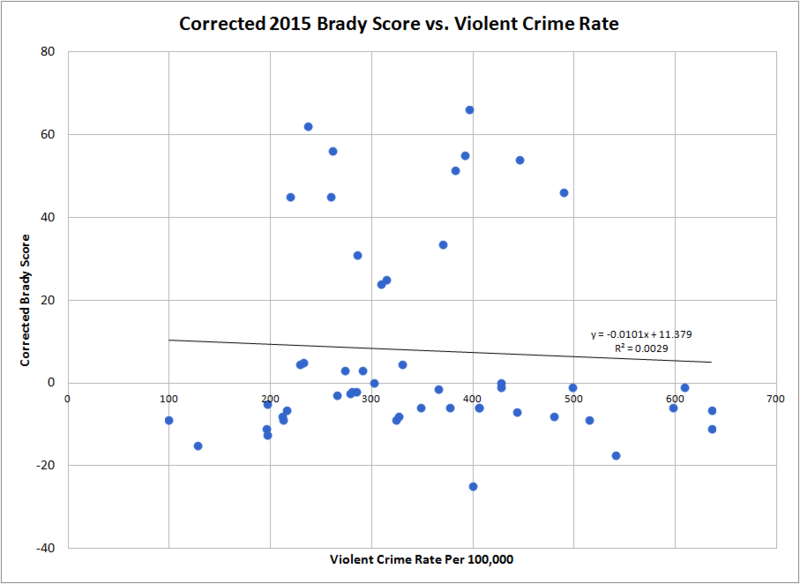 In other words, the corrected 2015 Brady Campaign “Score” for a given state correlates with that state’s violent crime rate with a coefficient of -0.0539. Which is to say, it doesn’t correlate at all. Put simply, a correlation of -0.0539, given a sample size of 50 entities, is not statistically significant. Or, to spell it out explicitly, there is no correlation between the Brady Campaign “Scorecard” and the safety of those states’ residents. There is no evidence, whatsoever, that the laws supported by the Brady Campaign to Prevent Gun Violence Ownership are making anyone any safer. Granted, those laws do not appear to be hurting – that is to say, crime rates have not gone up due to the implementation of those laws – but they still amount to unjust limitations on an individual’s Constitutionally-protected right to keep and bear arms. For that reason alone, they should be struck from the books; the fact that they are not helping reduce crime is merely icing on the cake. Author JonathanPosted on August 12 2017 October 5 2017 Categories dataTags brady bunch, brady campaign, brady campaign to prevent gun ownership, brady campaign to prevent gun violence, cake, california, corrected, correlation, crime guns, fbi, federal bureau of investigation, gun control, gun control extremist, gun deaths, hawaii, negative, pro-rights, score, scorecard, statistically significant, ucr, uniform crime report, violent crime3 Comments on the 2015 brady campaign state scorecard – how does it score?